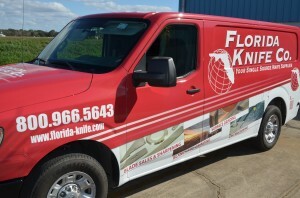 Florida Knife has added a new van to the delivery route. Our delivery service includes the greater Tampa, St Pete and Clearwater areas, in addition to the Orlando Metro area in some situations. For a limited time Florida Knife is offering a 5% discount on your next blade order when you see and snap a picture of the van on its route. Be sure to take advantage of the incentive and we look forward to serving you.